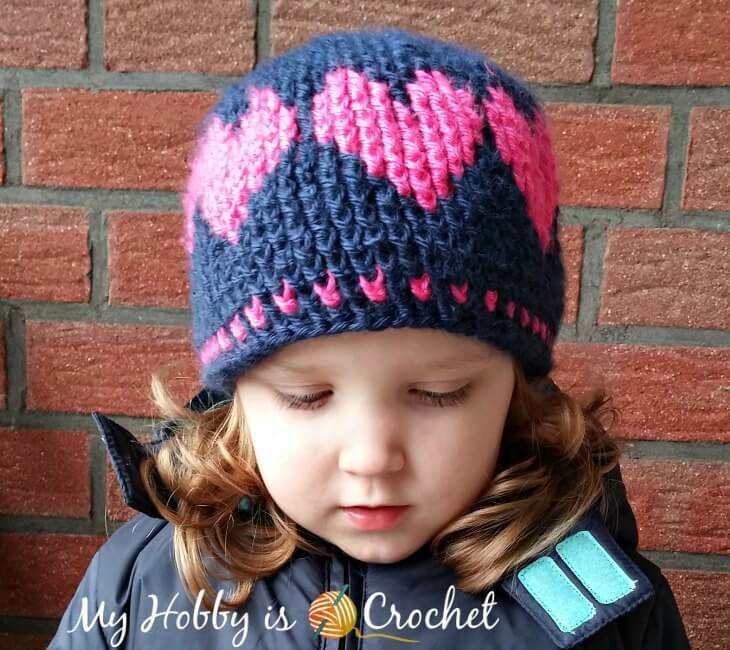 This cute crochet hat with hearts going around is worked top down, in rounds, using post stitches that create a think and warm texture, perfect for winter hats! The hearts are made with color changes using a new version of Fair Isle Crochet, replacing the traditional single crochet stitches with front post double crochet stitches. 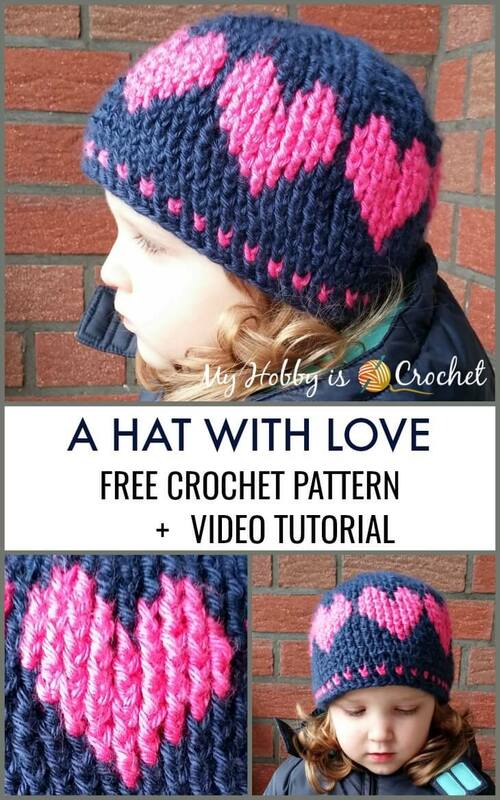 This hat would be a great project to make as Valentine's Day gift, but not only! *Disclaimer: This post contains affiliate links and at no additional cost to you, I might earn a small commission if you decide to purchase your supplies online. Thank you! A long time ago, I used to knit and loved designing Fair Isle Charts. I wanted to obtain a similar effect in crochet. I tried the traditional Fair Isle Crochet using single crochet stitches and also single crochet back loops only, but the images are not as sharp as in knitting. 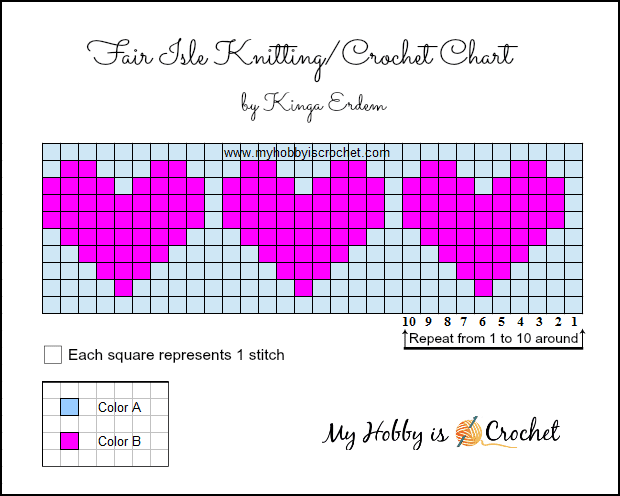 The front post double crochet stitches remind me a lot of knit stitches and they work really great for crocheting with graphs. I hope you will love this hat as much as I do! The hat will fit children age 3-5 years. For smaller/ bigger sizes work less/more rounds with increases for the crown of the hat and adjust the length. The heart pattern is a multiple of 10. This hat has 7 hearts around. If you will make the crown smaller/bigger, you will have less/more hearts in the round! Another way to change the size is to use a different yarn weight and hook size. If you will make larger sizes, you might like to place the hearts a few rounds below, by working a few more rounds in main color before starting with the hearts. SPECIAL STITCH : THE Standing Double Crochet: see this tutorial by Moogly. The hat is worked in rounds top down. Each round begins with ch2, that will not be counted as a stitch. Work the LAST fpdc of each round around BOTH the beginning ch2 and the first fpdc of the previous round! This will make the seam less visible. Each round ends with a sl st into the top of the first stitch of the round, not into the top of the ch2. 1) The crown of the hat: Begin with a magic ring. Use the heart chart below. Each little square represents 1 stitch! Start reading the chart from top to bottom, right to left. Note: the top row in the chart stands for round 8 (the round before starting the hearts) and the bottom row in the chart stands for the round 17 (first round after finishing the hearts). 1) How to change colors: Work the last st before changing colors till half; having 2 loops on hook, pick the new color yarn and end the stitch, pulling the new color yarn through the 2 loops on hook. You can watch this Video Tutorial by Happy Berry Crochet, for an example how to change colors when working dc stitches. For front post stitches, you'll change colors in the same manner, only doing fpdc stitches instead of dc sts. 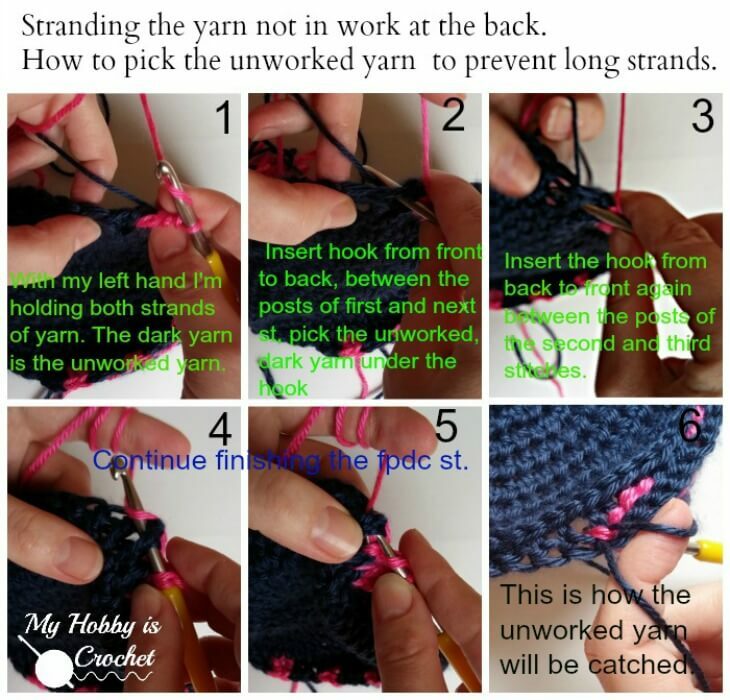 2) Stranding the yarn on the wrong side of the hat: You will not cut the yarns when changing colors, you will not work over the yarn not in use, you will carry the unworked yarns across the back.Watch this Video Tutorial by Stacy from Fresh Stitches to learn what stranding is. Very important! Keep the tension of the strand not in use a little loose, so that the hat keeps the elasticity!! !!! To avoid long floats of yarn, when you are going to have to carry the yarn more than 5 sts at the back of the work, you need to catch the yarn not in use! 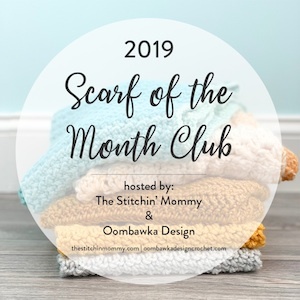 For example, when you have to change colors after 7 sts made with CC, pick the MC yarn (the yarn not in use) in the middle of those 7 stitches this way: work 3sts in CC, while you're working the 4th st, pick the MC yarn, then work the next 3 sts in CC. How to pick the unworked yarn was the most challenging part, because for the fpdc, we are working inserting the hook around the posts of stitches! This is my way: Wrap yarn (here CC) around hook, while with the left hand hold both strands of yarn (MC and CC) as in picture 1 from photo collage below. Insert your hook from front to back between the posts of the first and second double crochet of the row below, picking the unworked yarn under the hook and then insert the hook from back to front again between the posts of the second and third stitches. 3) How to prevent yarn strands from tangling: always place MC strand to your right and CC strand to your left. Dots (or small hearts) Pattern (rounds 19- 22):; made using a variation of the stitch pattern used in my Gumdrops Earflap Hat. Check out my Step by Step Picture Tutorial. Note that for the Gumdrops Hat are used front post triple crochet stitches and in this pattern front post double crochet). Round 23: With MC, ch2, sk next fpdc of previous round, *work 1fphdc around unworked fpdc 2 rounds below, ch1, sk next fpdc*, repeat around from * to*, sl st to top of first fphdc. Cut yarn. Fasten off. Weave in the ends. 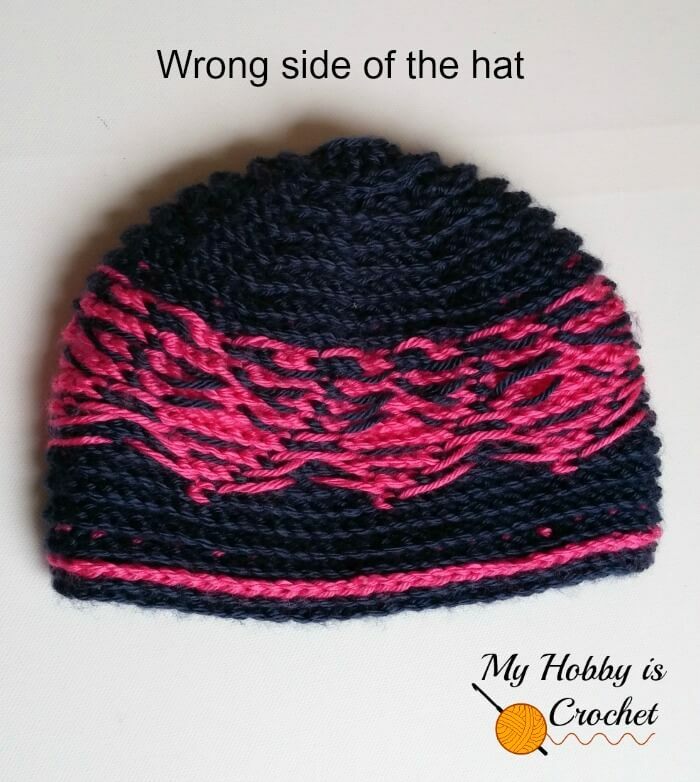 I hope you have enjoyed this pattern and had fun working the Hat with Love! You might also like the Heart & Sole Slippers, another cute pattern with heart graph and written instructions. For more free crochet patterns please visit my FREE Crochet Pattern Page!